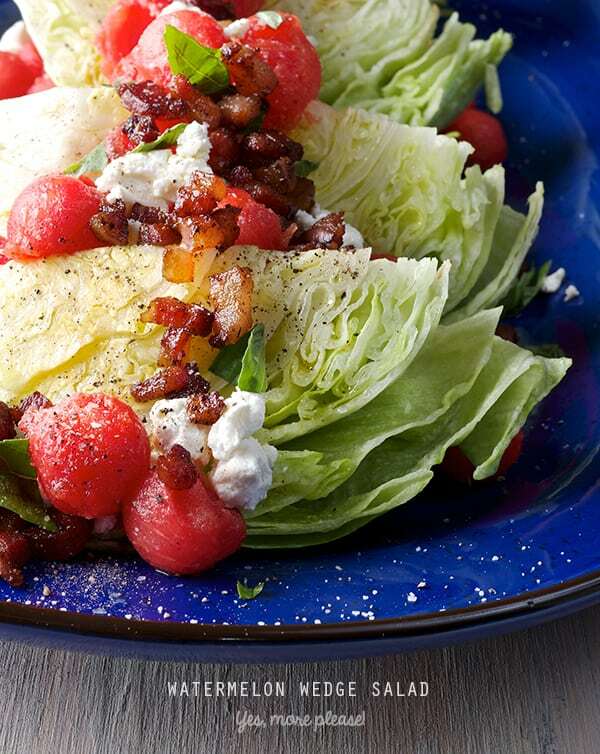 Watermelon Wedge Salad ~ Yes, more please! Its hot in here! Austin is reaching 100F temperatures. All I can think of is something refreshing. I’m craving lots of juicy ingredients. 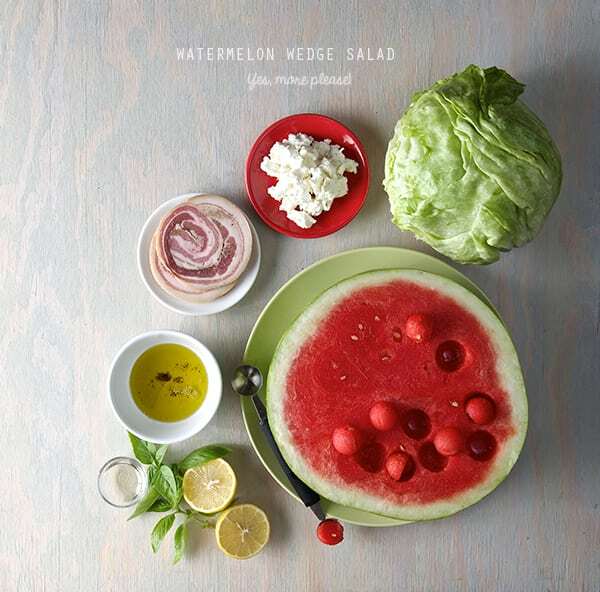 So what to make?… Watermelon and iceberg lettuce together its the ultimate ode to crisp and fresh. 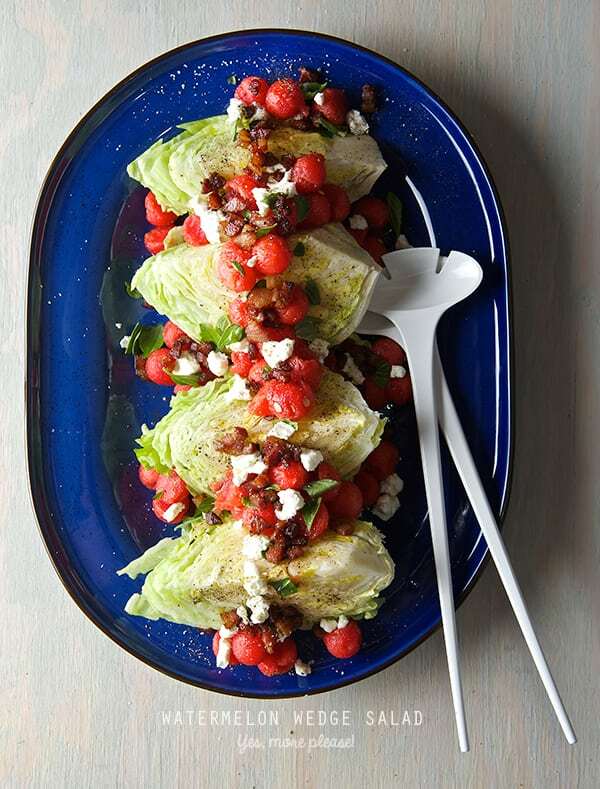 Inspired by the classic wedge salad, I played with summer flavors and made a Watermelon Wedge Salad. 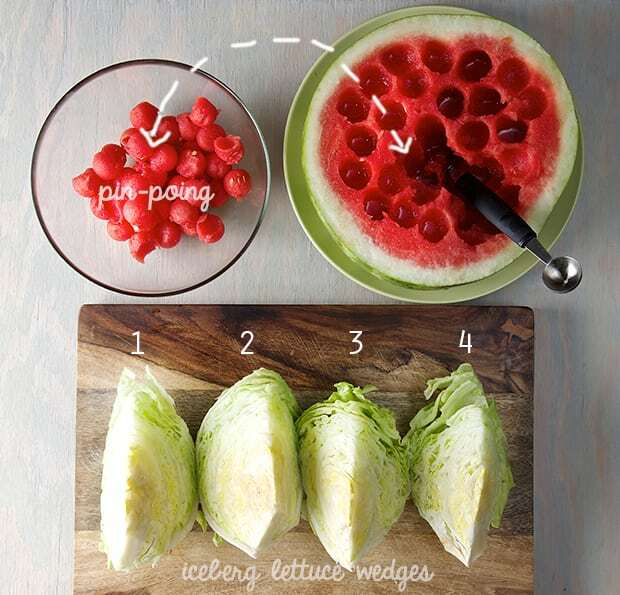 It consists of one head of iceberg lettuce cut into quarters plus a good sweet crisp watermelon dressed with a light and clean, olive oil + salt + black pepper dressing. 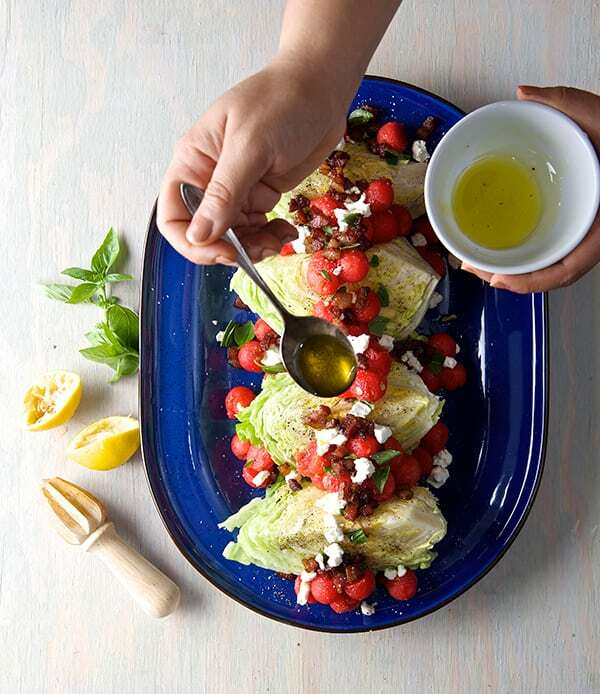 One bite has it all; crisp crunch of the iceberg lettuce, tangy lemony light dressing, sweet juicy watermelon, creamy and salty pancetta, fragrant basil adds a great herb note. This recipe is a pairing of summery ingredients that work divine together. Much like a summer gathering of good old friends having a good time. Easy, fast and fun to make, in a blink of an eye this salad is ready to cool you down. that is what is playing on the background. 4 cups seedless watermelon chilled. ½ cup goat cheese crumbs. 2 half inch thick slices of pancetta. Small bunch 6-8 large leaves fresh basil. 1. 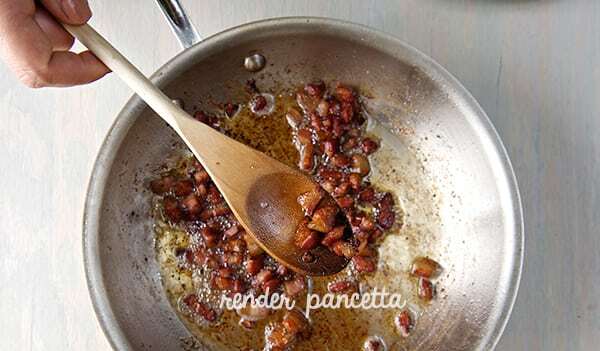 Cut the pancetta in small cubes, sauté until crisp and render the fat. Place them over a paper towel to absorb the excess fat. 2. Remove the hard steam of the lettuce. 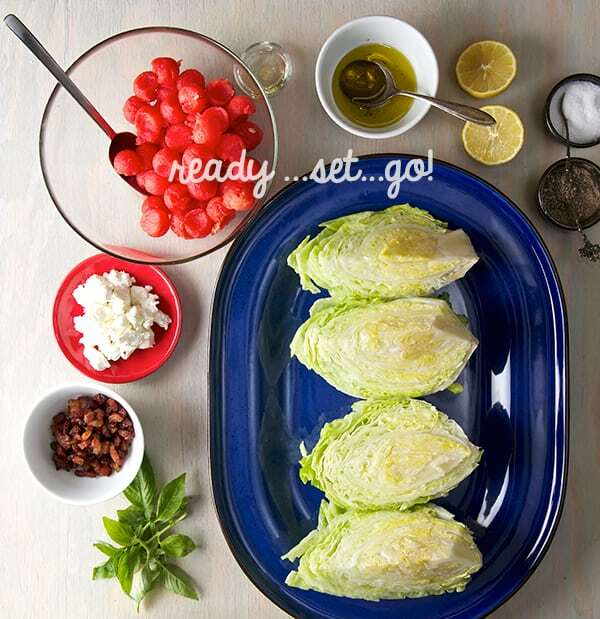 Cut the head lettuce in four wedges. 3. With a melon baller scoop 4-5 cups of watermelon balls. 4. 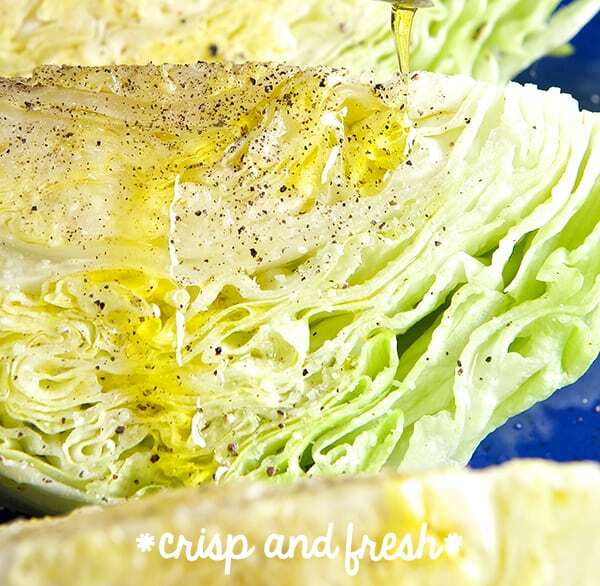 Place the lettuce wedges on a plater, and drizzle olive oil, the juice of 1 lemon, generous amounts of kosher salt and black pepper. 5. 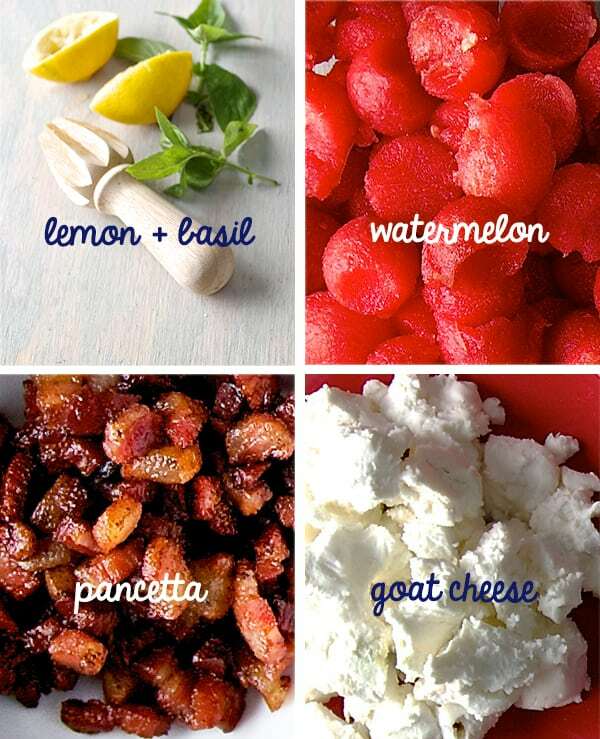 Add the watermelon balls, crumbled goat cheese, crispy pancetta. 6. Tier the basil leaves and sprinkle on top, add the rest of the lemon juice a little extra drizzle of olive oil, serve. Note: Make sure your watermelon is cold, place it into the refrigerator hours before to ensure maximum chill! This salad taste better when the crisp clean iceberg lettuce and the juicy watermelon are cold. Mirror, mirror on the wall who’s the freshest of them all?